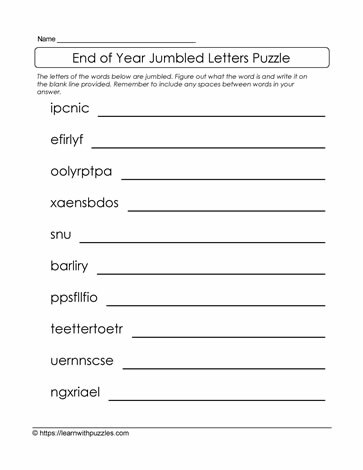 Here is an end of the school year jumbled letters puzzle that kids can solve. Keep kids engaged by giving them challenges to solve. To complete the puzzle, unscramble the letters to form words or groups of words (remember to leave spaces between the words) and record the answer on the line. Use knowledge of end of year vocabulary and some summer activity words to unjumble the letters.